Hello all! I just found this forum, and am enjoying it immensely. My husband and I were on Craigs list, and read a post that someone had found a tiny chowling in a warehouse district, abandoned, and were looking for a forever home for her. 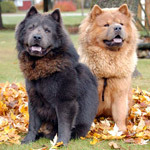 We already had one rescue dog, and an 11 yr old half chow, and are very comfortable with being chow parents. We drove two hours to go meet the little chowling, and it was not even an option to leave her behind. She was only 5 weeks old, and the couple who found her had already taken her to the vet and gotten her the emergency care she desperately needed. The best we could figure out was that a breeder probably dropped her off in this warehouse district to get rid of her. She was probably the runt, as she was very very tiny, and her ears didnt stand up, and her tail was not curled. He probably figured he couldn't get enough money out of her (grrrrrrrr). She was covered head to toe with ticks, fleas, and dog lice, was very anemic and skinny. She would have died within the next 24 hours. Their vet and ours both agreed she is pure chow, and with a lot of love, good food, and tlc, had a good prognoisis. Poor baby was half bald, fit in our hands, and was scared of everything. She wouldnt take treats, and hid from everything. We carried her everywhere, she slept in the bed with us, and we gave her an intense crash course of socialization. Our sweet girl is now a year old, her ears stand up perfectly, and her tail curls up when she is secure and happy, which is 99% of the time now. She is still reserved with new people, but what chow isnt? After 3 or 4 times of being with a new person, she allows them the exquisite pleasure of scratching her favorite places (oh the sacrifices she makes). She is now sassy with her older brothers, and they allow her every whim. I don't have pics of her as a baby, or my other boys on this computer yet, will post later, but for now, here is our baby. Hi there, and welcome. She has grown to be a very pretty girl, she looks a lot like my Firesong too! Since their ears don't stand up all the way until 8-14 weeks and their tails don't curl over their backs until about the same age, I don't think the breeder or whoever, got rid of her at that age for those reasons. It might have been that the mother chow died or rejected her. That often happens. Still the human should have taken on the mother's role at that time at least until the little one was 8 weeks old. Sheesh, some people. I'm glad she was found by people who cared and who have been able to raise a good looking, well adjusted chowgirl. She can't say it so I will, Thank you! What a wonderful rescue story! Welcome to the forum! Happy Happy Joy Joy ... what a wonderful story!!! She is just beautiful. WTG!! Yes indeed - wonderful story and what a lucky little girl to be loved by you. Lucky too to be taken to the vet and given the urgent treatment she needed. Bless you for taking her in.